Black and white portrait of famous harness race driver Walter Gibbons (1899-1975). Gibbons was born in Bridgeton, Nova Scotia, the son of horse trainer Wesley S. Gibbons and Lillian Gibbons. The family relocated to Reading, Massachusetts where Walter Gibbons drove his first mile at age 8. By age 14, Walter Gibbons was driving and training professionally. 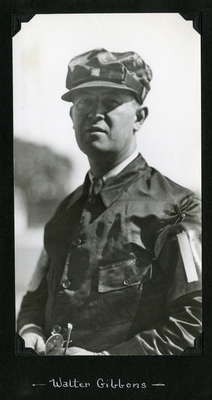 Following his successful driving career, Gibbons began officiating and working in racetrack management. He served as Maine State Steward. Walter Gibbons was inducted to the Harness Racing Immortals Hall of Fame in 1979.